Have you always dreamed of having fuller and thicker eyelashes? If so, Latisse® in Battle Creek may be the solution you’re looking for. For individuals who are tired of applying coat after coat of mascara to make their lashes look more voluminous, Latisse® in Battle Creek can be a godsend. Well-styled eyelashes have the ability to completely transform a person’s face. Through Latisse®, Battle Creek residents with short, sparse, or too few eyelashes can safely and easily achieve their beauty goals. By stimulating hair cells to go into a growth cycle when they would typically be in a hibernation state, Latisse® in Battle Creek is sure to make your lashes look longer and thicker. Wake up to fuller, lusher, and more beautiful lashes every day by trying Latisse® in Battle Creek! What Is Latisse® in Battle Creek? Latisse® is an FDA-approved prescription treatment that is used for growing eyelashes. Individuals who feel that their lashes aren’t long, voluminous, or thick enough can choose to have Latisse® in Battle Creek applied on them. Although many see Latisse® in Battle Creek primarily as a breakthrough used for purely cosmetic reasons, it is actually a version of a glaucoma drug in eye drop form. When the glaucoma drug was first approved by the FDA, many eye doctors and their patients noticed the hair growth side effect. 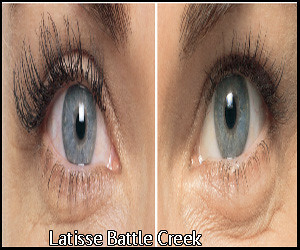 Using Latisse®, Battle Creek residents can grow longer and lusher eyelashes over time. What Is Latisse® in Battle Creek Made of? A man-made product used to treat cases of glaucoma, Latisse® in Battle Creek is comprised mostly of bimatoprost, a substance known for enhancing the growth of lashes. Some inactive ingredients of Latisse® in Battle Creek also include benzalkonium chloride, citric acid, sodium phosphate, sodium chloride, and dibasic and purified water. How Do You Apply Latisse® in Battle Creek to Your Lashes? The procedure for applying Latisse® is fairly simple and easy. Before applying Latisse® in Battle Creek, you must first remove your contact lenses and any makeup you have on. Then, make sure to thoroughly cleanse your face. Once this is done, put a drop of Latisse® in Battle Creek on the provided applicator. Then, you can apply the medication along the base of your upper eyelash line, starting from the innermost corner to the outermost. To see results, apply Latisse® in Battle Creek like an eyeliner at least once daily for the first four months. Is Latisse® in Battle Creek Safe? Since Latisse® is an FDA-approved prescription and was initially created to treat eye conditions such as glaucoma, it is unlikely to cause any damage to the eye. However, keep in mind that you should take safety measures when using Latisse®. Battle Creek residents who use this treatment must avoid contaminating the dropper or the contents of the bottle. To do this, they must replace the dropper after each use. What Is the Recovery Process of Latisse® in Battle Creek? With Latisse®, there is no downtime. Immediately after applying it to your eyelashes, you can go back to your daily routine. For most patients who use Latisse® in Battle Creek, eyelash growth is gradual. You may start noticing your lashes growing longer during the first four weeks. If you’re looking for ways to achieve your beauty goals, Restorative Health Care is here for you. We offer a variety of minimally invasive cosmetic treatments, including CoolSculpting®, Kybella®, Juvederm®, Latisse® in Battle Creek. Consult with us, and find out whether Latisse® in Battle Creek is right for you! Whether you need help with weight management or eliminating unsightly varicose veins, our professional team is here to provide the solution to your problems. With our guidance, you can better manage your nutrition, battle chronic illnesses, and even regain confidence in your appearance. Click here to learn more about our treatment.